The Monteverde bottled fountain pen ink now comes in a smaller 30ml sample size. Monteverde Ink is one of the world's leading fountain pen inks. It is fairly inexpensive and comes with the leading European ink treatment formula, ITF™, designed to improve the ink flow. It is gentle on your pens and the added lubricant staves off any clogging and corroding. Monteverde fountain pen ink also has a quick dry time. Choose from a wide selection of ink colors! 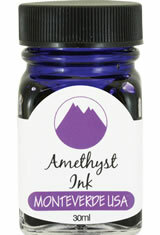 The Monteverde Bottled Ink(30ml) Fountain Pen Ink usually ships within 1 business day unless otherwise specified. Each Monteverde Bottled Ink(30ml) Fountain Pen Ink we sell is guaranteed to be genuine, authentic and will arrive brand new & unused! I love Monteverde inks but this colour was a bit of a disappointment. A bit grey blue and not too much pop or brightness that I was hoping for. I will probably give it away as it is quality ink but not the blue I wanted. I have to order all online so sometimes I get it wrong but it is only personal taste as there is nothing wrong with this ink at all. My favourite Monteverde ink is California Teal so I am a happy Monteverde customer. Ruby is a bright, pretty red color with a slight hue toward a reddish-orange when dried, purple reign is a light (almost on the neon side) purple - Monteverde inks have seemed a bit on the drier side than most of the other inks I've tried, but seem to perform great in flex pens. Smaller bottles have proven easier to store. Larger bottles are pretty but are much larger and the shape of them requires a bit more space when storing them (which matters for me). Beautiful purple. this color just pops off the page. I like the smaller bottles that are a great value to try a lots of different colors. This review is about Copper Noir. I have some of the other Noirs from MonteVerde and there seemed to be more of a color shift with the other inks. Don't misunderstand, this is a soild, well behaved ink that flowed well in any of the fountain pens that I have used it in. It just didn't have that something I was looking for was all. Could be that it's just personal preference. The hunt for the one ink that strikes my fancy continues.